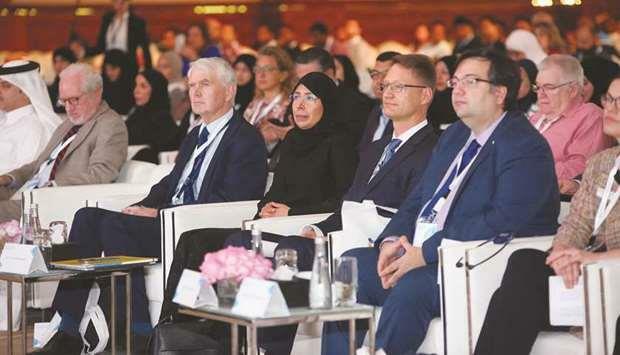 (MENAFN - Gulf Times) Impact of biobanking in healthcare of Qatar, need for international collaborations as well as quality assurance were some of the topics of discussion on the first day of the International Biobanking Conference 2019 organised by Qatar Biobank, a member of Qatar Foundation (QF). The opening session of the three-day event being held at Sheraton Doha was attended by HE the Minister of Public Health Dr Hanan Mohamed al-Kuwari; Dr Richard O'Kennedy, vice president for Research, Development and Innovation, Qatar Foundation (QF RDI); Dr Jens Habermann, president, European and Middle Eastern Society for Biopreservation and Biobanking (ESBB) among other dignitaries. Scientists and health experts from 15 countries are taking part in conference that aims to highlight the role of biobanking and medical research in advancing healthcare and improving clinical outcomes. Speaking at the opening session, Dr O'Kennedy said that a biobank is the foundation for precision medicine. 'Biobank provides the necessary samples for testing and clinical trials for precision medicine. Precision medicine will reduce economic cost and provide better healthcare for all. Biomedical research is accelerating the transformation of healthcare from generalised treatments to preventive, pre-emptive, and personalised medicine. In this domain, QF RDI has been active through impactful initiatives spearheaded by Qatar Biobank and Qatar Genome Programme, stated O'Kennedy. 'As a crucial first step in the approach to precision medicine, the value of biobanking and genomics research, and their key role in improving the health and well-being of Qatar's population, cannot be overstated. It is through events as this conference, our scientists and researchers have the right platform to engage in the exchange of knowledge, conduct in-depth discussions with global experts on new developments and innovations; and forge networks and meaningful collaborations that could support the development of Qatar's precision medicine initiative, explained the official. Delivering the keynote address, Dr Jim Vaught, chief of the Biorepositories and Biospecimen Research Branch at the US National Cancer Institute, and editor-in-chief of Biopreservation and Biobanking, highlighted the importance of quality management for international biobanking collaborations. 'The International Biobanking Conference is a testament to how far Qatar has come in a relatively short space of time not only in setting up its biobank, but in organising this important global discussion to tackle quality management in biobanking, bringing together participants from so many different countries and influential speakers from the key international institutions to share their experience and best practices, noted Dr Vaught. 'I am impressed with the automation and quality control procedures Qatar has put in place at its biobank facilities. It is wonderful to see the progress being made and the milestones reached by Qatar Biobank, with the number of participants who have been screened to date, and the institution's overall approach to studying the Qatari population, he added. Dr Asmaa al-Thani, board vice chairperson of Qatar Biobank and chairperson of Qatar Genome Programme Committee, said, 'We take firm steps every day as we get closer to achieving personalised medicine for the people of Qatar, which will prove vital in the treatment and prevention of diseases. The support we are receiving for our research programmes from our stakeholders, scientists, and the residents of Qatar is one of the driving factors in our success story. The event, held under the theme ‘Quality Matters: A Global Discussion in Qatar,' is being hosted in partnership with the European and ESBB, and supported by BBMRI-ERIC, a European research infrastructure for biobanking, and the International Society for Biological and Environmental Repositories.